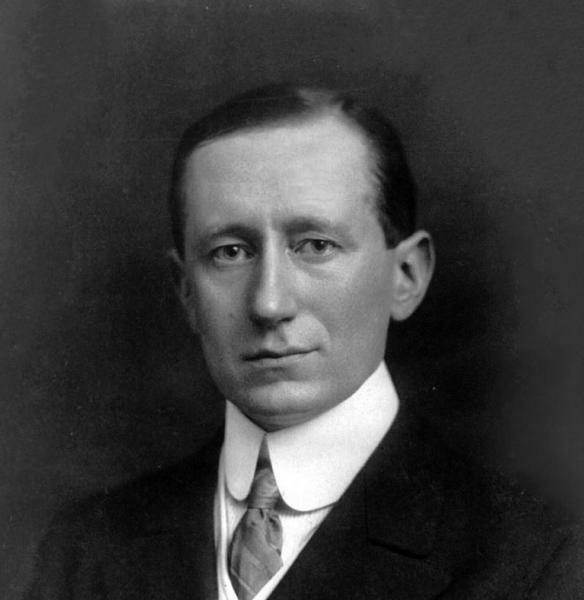 Guglielmo Marconi (1874–1937) was born in Bologna, the second son of aristocrat Giuseppe Marconi and his Irish wife, Annie Jameson, granddaughter of the founder of Jameson Whiskey. At Villa Griffone, the parental estate in Pontecchio, young Marconi studied with his neighbour, the physicist Augusto Righi, and became fascinated with electricity and especially the research Heinrich Hertz had done with electro-magnetic 'Hertzian' or radio waves. He carried out his first experiments at age 20 in the attic, and eventually succeeded in sending a transmission a mile and a half over a hill. Realizing the potential of his discovery and in need of more funding, he wrote to the Italian minister of Post and Telegraphs about the new wireless (the minister thought he was insane and never replied). But Marconi was fortunate in having connections and knowing the right people. Through a family friend, he contacted the Italian ambassador in the UK, who advised him to come to England and patent his discovery as soon as he arrived. Marconi duly did with the help of his cousin Henry Jameson Davis, filing the world's first patent for a system of telegraphy using Hertzian waves (British Patent number 12039, filed on the 2nd June 1896). The following year he undertook a series of demonstrations for the British government, each time transmitting messages further and further. In 1899 he founded the London-based Wireless Telegraph & Signal Company (later the Marconi Telegraph Company, then Marconi PLC, now part of Ericsson), and two years later, on December 12, 1901, he sent and received the first wireless message across the Atlantic, from Cornwall to a military base in Newfoundland using a 500-foot kite-supported antenna. Until then, it was widely believed the curvature of the earth would affect the transmission. Marconi proved them wrong (you can hear him describe the experiment in his own words. The wireless revolutionized communications from ship to shore. In January 1909, 1,700 people were rescued off east coast of the United States after the RMS Republic collided with the Italian steamer the Florida in thick fog. Jack Binns, the Marconi radio operator aboard the Republic, sent out two hundred messages to help guide rescuing ships to his position. In charge of the Italian radio service in the First World War, Marconi later worked on short wave, beam transmissions and continuous wave transmission; On 15th June 1920, a Marconi 15 kW telephone transmitter at the Marconi works in Chelmsford hosted Britain's first public broadcast programme, a song recital by Dame Nellie Melba. Two years later, the BBC was born. In later years, Marconi lived in Rome, and joined the Fascist party; in 1930 Mussolini made him the head of Italy's Royal Academy. He died in 1937 of a heart attack.